A 74 metre new construction Amels motor yacht has been sold with the buyer introduced by Merle Wood & Associates. To be built in steel and aluminium, her Tim Heywood exterior shares the original Limited Edition 242 profile that the Dutch yard introduced three years ago when it launched the model. The owner will customise the interior to their own tastes. The Amels 242, at 1,787 GT, will be used for world cruising and features an elongated aft deck, creating exterior luxury spaces with a light and airy volume. Notable features include an entirely private 374 square-metre owner’s deck with a forward-facing stateroom, and the award-winning full-beam midships wellness and relaxing spa area with a unique 19.5 square-metre folding beach platform. On the main deck aft there is a large infinity pool with tenders stored below on either side. The sun deck features an intimate hot tub surrounded by sunpads, while the bridge deck includes a touch-and-go helipad. 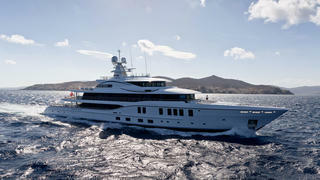 An Amels spokesman said the yacht will "show a different character" to previous Limited Editions deliveries. The asking price of the Amels 242 Limited Edition has been withheld.